For those of you that shoot and have a dorky side (like me!). Here is a cleaned up version of the original poster. Go here for the original version. This is making a lot of assumptions about the aliens physiology. Vital organs could be located in other parts of their bodies. Haha, the man speaks the truth! The laws of evolution mean you can make certain assumptions about physiology based purely on outward appearance. I think its safe to say the head contains a "vital organ" because is going to always be located near the eyes if the creature has eyes to reduce delay in the receiving of information. If the creature has a central nervous system and spinal column, looks like it does, then that would also necessitate a brain at the "top" of it. I think this is more open to debate, but is the theory behind hitting center mass more because of stopping power than killing (aka striking vital a organ) anyway? 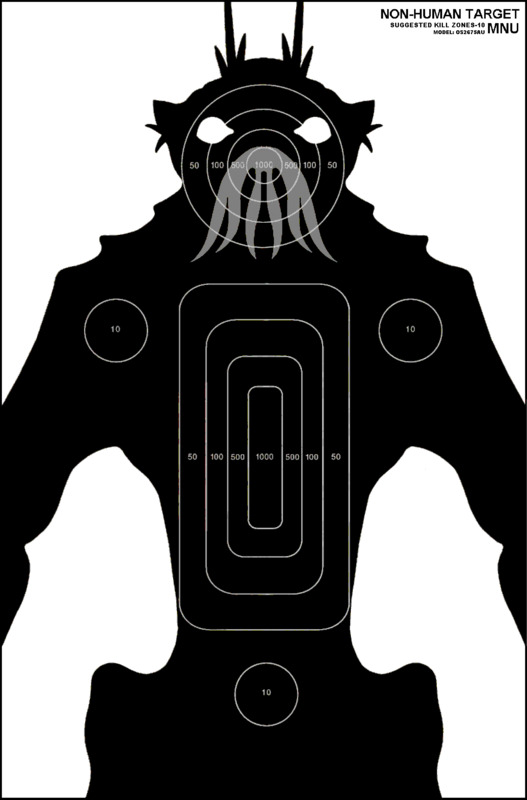 The optical sensors could be telepathically linked to the feet, creating a sensory link obviously consisting of energy alone, not involving a transmittal organ like a spinal cord, and thus un-interruptable by targeting the head itself...although i admit a shot directly to the optical sensor (however unlikely) would most likely result in serious damage to the prawn's ability to attack and defend. the laws of evolution state nothing about preconcieved notions of biology specific to this planet. i do however, agree, that based on the propaganda from the movie....a shot to the crotch region would be devastating.